A Prime Time investigation into "crumbling" houses in Donegal has led to a "huge increase" in the number of homeowners coming forward with fears their properties may be affected. 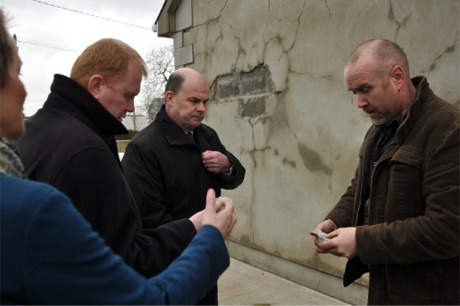 The Mica Action Group (MAG) said the 'Bad Blocks' exposé on RTE on May 31 sparked concerns among people about the safety of their own homes. Mica chairman Phil McDaid said: “In the two weeks since the programme aired, the number of homeowners making contact indicating they believe they are also affected, has increased by approximately 25% to around 350. The numbers are continuing to rise on a daily basis and come from homeowners across the county." He added: “The dedicated phone number and email for the group has never been busier. Mr McDaid said the programme "highlighted serious shortcomings in the manufacturing, regulation and inspection of concrete block production in Ireland". "Anyone who watched the programme has seen the results – some homes now abandoned, insurance withdrawn, cannot be sold and have no value. This is not to mention the attendant issues - anxiety, stress, hopelessness, depression, anger and feelings of having been let down by the providers of the materials, the council, regulatory bodies, mortgage provides and the Government," added Mr McDaid. MAG is seeking redress for all affected homeowners and are actively engaged with the Government-appointed independent panel on the issue. The group said it looks forward to a meeting with Minister Damien English next week when he visits the county and will reiterate its call for redress. MAG can be contacted by email at micaactiongroup@outlook.ie or by phone on 086 8648888.